Connecting external hardware to graphing calculators has long been one of the most exciting areas the calculator hobbyist community has pursued. As far back as 1996, the venerable RichFiles SPinTerface was created, and since then, there has been the Emerson PS/2 library for connecting mice and keyboards to calculators, calculator mind control, calculator networking, calculator WiFi, and linking protocols and hardware of every description. Most recently, there has been my own ArTICL library (source on GitHub), which lets your TI-BASIC programs interface directly with an Arduino attached to your TI calculator, to control LEDs and motors, read sensors, buttons, and switches, and access everything the Arduino can do. The TI-Innovator is encased in a durable plastic enclosure, with three 4-pin input ports and three 4-pin output ports (power, ground, data 1, and data 2, presumably) for peripherals. It communicates over USB-over-serial to the TI-84 Plus CE and TI-Nspire CX, which leads us to believe that we could use other USB-over-serial capable devices with the new TI-OS. Actually, the TI-84 Plus CEs in the TI-Innovator room were running the unreleased TI-OS 5.2; although there were three or four new features in the OS, including new ways to manipulate strings and have timed Pauses in the OS, we'll hold off discussing specific commands until we know that they'll definitely be in OS 5.2. TI has been developing lessons for the TI-Innovator in three areas: (1) Middle school science; (2) Ten Minutes of Code for older students; (3) Fundamentals of Making. 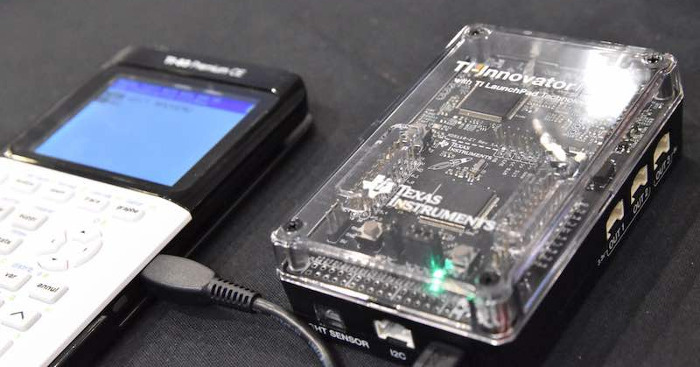 The TI-Innovator can initially be used without any external hardware, other than a graphing calculator. The MSP432 Launchpad already has LEDs on-board, both single-color and RGB, and the TI -Innovator box also contains a speaker and a brightness sensor. When students are ready to use the Innovator with more hardware, it includes standardized CBL-style ports compatible with a random of external hardware like sensors, buzzers, and motors. TI will offer the "TI-Innovator Fundamentals Pack" with resistors, capacitors, LEDs, and other discrete components with accompanying activity guides, as well as the "TI-Innovator Science Pack" with sensors, motors, and other components that connect to these ports. The box also breaks out some of the MSP432 Launchpad I/O pins for direct use, and very advanced students can even unscrew the plexiglass cover and use the MSP432's pins directly. We look forward to seeing what students and teachers will do with this new hardware, and congratulate TI on embracing calculator-driven electronics education. If their experiences are anything like ours over the past two decades, there's a huge potential for students to get more interested in electrical engineering and programming, and we look forward to seeing how that evolves. Finally, as soon as we have our hands on a TI-Innovator ourselves, we're excited to bring you a hands-on review of the device. © Copyright 2000-2019 Cemetech & Christopher Mitchell :: Page Execution Time: 0.159982 seconds.